Fragment – Petrosubjectivity, courtesy Brett Bloom. Brett Bloom is a member of the United States-based collective Temporary Services, with whom he has been making use of art since 1998, conducting publishing activity with Half Letter Press, organizing social projects, examining the traces of grass-roots creativity, and establishing artistic cooperatives. Temporary Services declares, “The distinction between art practice and other creative human endeavors is irrelevant to us.” This exhibition presents a report from another of Blooms’ interests – the themes and methods of deep ecology. Here the artist writes, lectures, and organizes Break Down Breakdown camps with the goal of becoming free from “petro-subjectivity” by creating alternative models of life and thought that reject the primacy of fossil fuels. 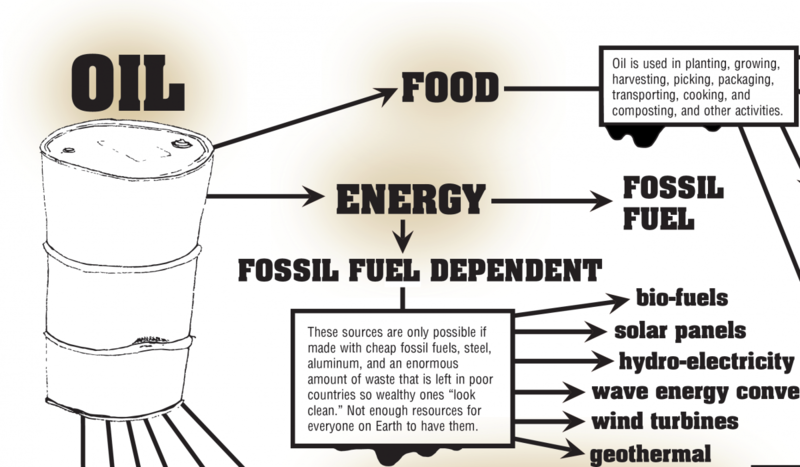 Inspired by studies of ecological costs in agriculture, the diagram shows the extent to which petroleum and its derivatives dominate all aspects of contemporary life; its combustion supplies energy, and it is used to produce most of the objects encountered every day. Oil shapes subjectivities and influences attitudes toward the world. The report presented in exhibition consists of a diagram licensed by the Museum of Modern Art in Warsaw for the duration of the exhibition. Courtesy Brett Bloom.